Many people in recovery have heard the advice “don’t get into any relationships in your first year” or the ever insightful “two sickies don’t make a welly”. There is other helpful insight such as “if you date in early recovery, be prepared to move in on the second date” and perhaps my favorite is rather than the Alcoholics Anonymous triangle of “Unity, Service, Recovery” there’s the new AA triangle: The apartment, the car and the girl. While the rooms of Alcoholics Anonymous, Narcotics Anonymous and many other 12 Step fellowships are filled to the brim with amateur philosophers, let’s remember a true story about the rooms of recovery: They are filled with people that cannot manage their own lives…but would be more than happy to takes yours on. The truth of the matter is that relationships are vitally important in the lives of someone newly clean and sober: a relationship with a sponsor, a relationship with a home group, a relationship with the fellowship and a relationship with a power greater than themselves. Romantic and sexual relationships, on the other hand, are not so cut and dry. Should someone in early recovery stay out of relationships for a year? Maybe. Maybe not. The truth is that relationships in early recovery often take a person’s focus away from what should be primary in their life- staying clean and sober and working with a sponsor through the 12 Steps. People that are able to put their recovery first and take the action requires of them through a recovery program (regular meetings, meeting with a sponsor, taking the steps, holding a commitment, etc.) can also engage in a healthy relationship. 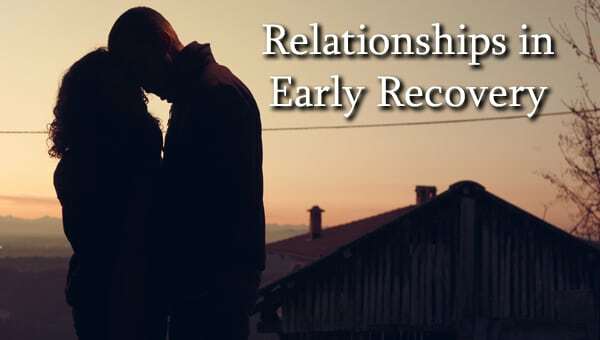 However, if a romantic or sexual relationship becomes more important than their recovery, new people will often fall into a trap of dangerous behaviors, emotional roller coaster rides and eventually relapse. Early recovery can be a difficult and emotional time for people. They are learning a new way of life, a way to live without the necessity for drugs and alcohol so that you may finally overcome addiction. Relationships can be difficult and emotional as well for regular people and even more so for people new to recovery. However, just like anything else in life, if a person newly clean and sober applies the tools for living they learn in treatment and in the rooms of recovery, just like drugs and alcohol a relationship is not something that someone needs to fear or avoid. The caveat is that just like a relationship for a normal person, a good, solid relationship in recovery starts with a good, emotionally healthy self. If you or someone you know is in need of help because of drug and/or alcohol abuse, please give us a call. Maryland Addiction Recovery Center offers the most comprehensive addiction treatment in the Baltimore City, Baltimore County and entire Maryland area. If we aren’t the best fit for you or your loved one, we will take the necessary time to work with you to find a treatment center or provider that better fits your needs. Please give us a call at (410) 773-0500 or email our team at info@marylandaddictionrecovery.com. For more information on all of our drug and alcohol addiction services and resources, please visit us at www.marylandaddictionrecovery.com.